2016 release, the third album from the New York band. 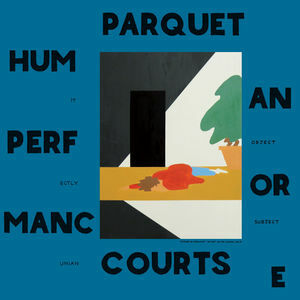 Human Performance establishes Parquet Courts as simply one of the best rock bands active in the world right now, no qualifiers needed. Not “in Brooklyn,” not “something-something millennial,” not “art-rock this” or “slacker indie that” – but a brilliant, accomplished rock band that have established themselves as deserving a role in the historical legacy of the genre alongside the likes of The Velvet Underground, REM, Sonic Youth, and Pavement. This album – their masterpiece – brings together the tunefulness, wit, and guitar wizardry that earned them a crush of critical praise and excitable fans right out of the gate, with a deeply human sense of drive, of yearning, and of wisdom earned. At times nearly overwhelming in it’s emotional density, at others astonishing with sheer sonic deftness, Human Performance is a rare achievement: breathtaking and brilliant.